The global economists disagree, though, on where oil prices will end the year. Economists Nouriel Roubini and Jim O’Neill may disagree on where oil prices are headed precisely, but they both see it strengthening in 2015, according to interviews Wednesday on Bloomberg TV. 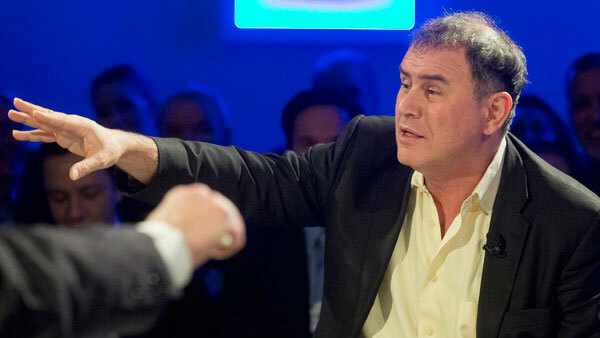 When asked if oil had most likely hit a bottom, Roubini said “yes.” His reasoning? “The fall in oil prices is leading to a reduction in [the number of] oil rigs in the U.S., and that is going to lead to a lag in production,” explained the New York University professor, who also chairs Roubini Global Economics. “Other producers with high marginal costs will produce less, and everybody will invest less in capacity,” Roubini said, noting that capital expenditures in the sector are “going to be down 25%-35% this year. The sharp drop in capex “will reduce the production of oil in the future, and forward prices already reflect less capacity and affect spot prices today,” he stated. Overall, the fundamentals today “suggest a gradual increase,” Roubini said. Of course, there could be surprises, say, if the U.S. were to reach an agreement with Iran regarding a phase-out of economic sanctions or if Iraq and Libya move to increase production. “But I don’t think these things are likely,” he said. “The fundamentals suggest that things are gradually going higher to $60-$65 per barrel by year end,” Roubini noted. O’Neill, former chairman of Goldman Sachs Asset Management International, is even more upbeat on where the commodity is headed. “I personally bought a call option on oil” around year end, he noted on Bloomberg TV. That move came after the British economist had been negative on it for about three years. While stable oil prices are something that “never happens,” O’Neill sees them moving “to $70-$80” per barrel by year end. As for the current strength of the U.S. dollar, “It’s remarkable,” the economist said. But a strong dollar may not be the best thing for the U.S.’ continuing recovery.